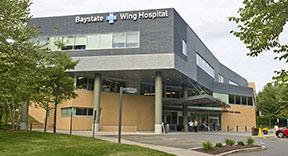 There are a combined total of 973 beds at Baystate Medical Center, Baystate Franklin Medical Center and Baystate Mary Lane Hospital and Baystate Wing Hospital. Baystate Health team members provided care for 45,585 patients admitted for care and 145,926 patients who sought emergency care. 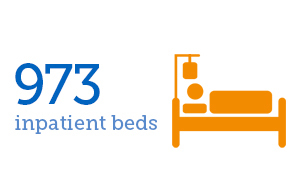 33,717 surgeries were performed in total at all Baystate Health facilities. 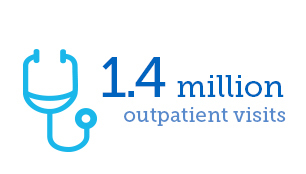 Over 1.4 million outpatient visits, including home visits, throughout the year. 4,543 babies were born at Baystate Health: Baystate Medical Center (4,043), Baystate Franklin Medical Center (500). Up to 119,300 inpatient medication orders per month are reviewed by Baystate Medical Center inpatient pharmacists to ensure patient safety and clinical quality in the medication use process. 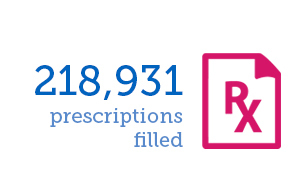 218,931 prescriptions were processed on the ambulatory-retail side of pharmacy. 89,295 home visits by Baystate Visiting Nurse Association & Hospice nurses. 3,317 home visits by Baystate Home Infusion & Respiratory Services nurses. 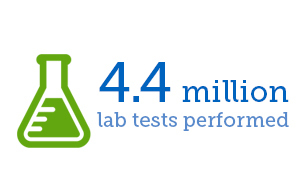 4.4 million tests performed by Baystate Reference Laboratories in 30 patient service centers throughout the region. 536 volunteers donated 47,770 hours to Baystate Medical Center; 320 volunteers and auxiliary members donated over 30,000 hours to Baystate Franklin Medical Center; 28 volunteers donated 3,000 hours to Baystate Mary Lane Hospital; and 48 volunteers donated 2,457 hours to Baystate Wing Hospital. 183,105 language interpreter sessions helped patients and families better understand their care in person, over the phone or via video; 3,692 pages of documents were translated for providers. 397 babies delivered by nurse midwives of Baystate Midwifery & Women’s Health, and 69 babies delivered in collaboration with our physician partners. Over 4,100 patients/families were approved for some type of public assistance through the efforts of the financial counselors.